Guarantees and brand equities play a huge part in gaining customers’ trust. Hence, the Golfsmith Fair-Way promise was created. In an effort to communicate this, the Fair-Way promise needed to live on the website. Since there were 4 tenets, I used the jQuery-UI accordion to hide the details so the customer could focus on the tenets one-at-a-time. 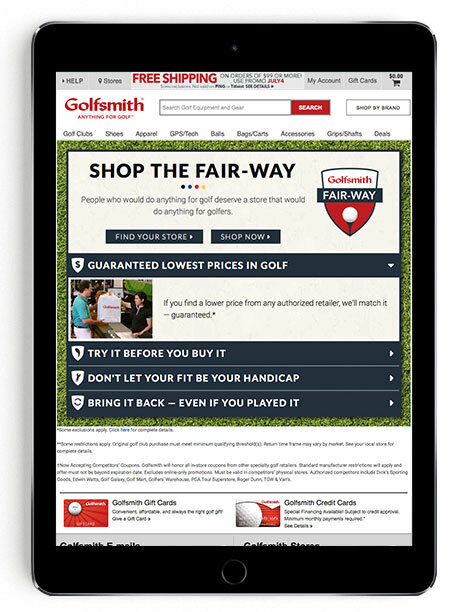 During the time of launch, Golfsmith’s branding relied heavily on golf course motifs, such as scorecards and turf. These themes are present in the landing page design.